Zales Review | What's our experience? Zales is one of the longest established jewelry retailers in America. A truly global country, their e-commerce side actually accounts for a very small percentage of their annual revenue and I have to say, after spending time on their website, I can see why. Those who have a tight budget, aren’t looking for a top quality diamond and like the convenience of buying from a chain store will probably love Zales. There are several benefits from shopping at Zales, as seen below, but please read the rest of this review before you hand over your cash. Zales claim to charge less than their competitors for their diamonds but the quality of these stones has been called into question many times. We decided to put this to the test by comparing a loose diamond for sale on the Zales site with one from another leading retailer. A search for loose diamonds on the site reaped no results so we took to Google. This took us to a diamond selling for a cool $60,000! Yes there was an image but absolutely no other info regarding the 4 C’s which is, quite frankly, ridiculous. Take yourself to the Whiteflash site and you can get one of their top end 1.211 ct, D, IF diamonds from the exclusive A CUT ABOVE range for a mere $28.500. We appreciate that not many people heading to Zales will be seeking out this caliber of stone. Anyone looking for a top stone to complete that dream engagement ring should not presume due to their marketing ploy that Zales, or Blue Nile for that matter, are the cheaper options. We have now proved that both of these retailers sell comparable items at higher prices than the bespoke companies James Allen and Whiteflash. The Zales Corporation owns several large jewelry chain store brands both in their own name and those of their partners. The best known, of course, is Zales itself which now operates out of over 700 stored across the USA and Puerto Rico. They also have stores at more than 130 outlet malls in America. The other major brands which come under the Zales umbrella are Gordon’s Jewelers and, in Canada, Mappins Jewelers, Peoples Jewelers and Piercing Pagoda. Back in 1924 M.B and William Zale, along with Ben Lipshy, opened the first Zales jewelers in Wichita Fall, Texas. While their aim was to sell the best quality merchandise at the best possible price they were also one of the first retailers to offer credit. They wanted their higher priced products to be affordable for everyone so offered their revolutionary finance plan of a penny deposit then a dollar a week. This combined with their reputation for outstanding customer service saw them expand rapidly. By 1941 they had 12 stores operating across Texas and Oklahoma. From there they continued to expand and grow and once they had conquered North America the rest of the world beckoned. With the inception of the Internet they adding online selling to their already numerous choices and today are probably the best known diamond retailer in the world and sell more diamond jewelry than any other North American retailer. Their business model is, and always has been, to give their customers the best choice at the best prices. It’s tough to know where to start with this one as Zales offer more designer and exclusive collections than any other site I’ve come across. Vera Wang is obviously the name that leaps out at you here but there are many other big names in there as well. The Neil Lane Bridal Collection is something pretty special and there are also celebrity collections, although it isn’t clear whether they actually designed them or are just endorsing them. Zales also offer an exclusive online collection which consists of a range of rings at heavily discounted prices. The design your own ring feature on the Zales site is extremely easy to use but while you can choose your setting you are buying your diamond blind, this is similar to Blue Nile. You have to wonder how a company who goes all out to let us know they offer the best value around are offering a setting of comparable quality to Whiteflash for almost $800 more? Add these to the stones we compared in the pricing section and that dream engagement ring costs over $30,000 less at Whiteflash. This has come as quite a surprise to us as well considering the respective companies reputation cheap and cheerful and top end bespoke. Once you have chosen your setting and stone an image appears at the end claiming to show you your ring but whether that’s the same stone from the initial settings page or is the stone you have actually chosen is anyone’s guess. Surely this shouldn’t really be classed as design your own when you can’t even see the diamond you have selected and thus could be given anything? You don’t build yourself the kind of reputation Zales enjoys by selling poor quality items. However, as you can see from the comparisons we have made they are not as cheap as they want us to believe. There is a serious lack of info regarding the actual quality standards and you have to dig really deep to find the IGI accreditation. As mentioned previously IGI are not one of the leading gem labs and their standards aren’t as high as either AGS or GIA. Zales make a big deal of how their ‘celebration diamond’ has been specially cut and has more than 100 facts. Your everyday consumer will go “wow!”, your educated customer will think “so what?” It’s not the amount of facets which make a great stone it how they interact with each other when the light hits them. If this isn’t pristine the number of facets doesn’t matter one iota. Warning! Enter the Zales website at your peril! From the outset the entire site feels cheap. 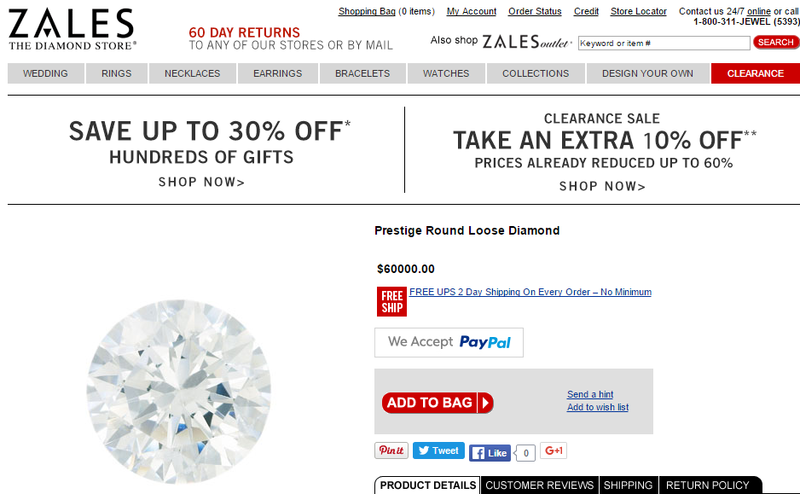 The home page of Zales.com is very cluttered and looks very bargain basement, and is nowhere near as enjoyable an experience as other sites I have visited. As you get deeper into the site it doesn’t get much better. All the information is down at the bottom but they do have more tabs than other sites due to the range of products they sell. Granted the home page does tell you what you need to know but the design could have been a lot better and more aesthetically appealing. Once you start navigating your way around the site you really get an idea of how much they actually sell. The options are seemingly endless and after a good hours flicking around the pages we decided to look at the engagement rings under the rings tab; except there isn’t one. Well, not at first glance anyway. What you do get is some pretty mediocre imagery of the various collections and multiple options to narrow your search. You have to look hard as Engagement is actually tucked in under Popular Styles at the bottom of the left hand menu. As the majority of jewelers cite engagement rings as their biggest selling item it doesn’t seem logical for them not to have their own, prominent listing. When I found one I liked and wanted to look at closer it was disappointing to discover I could only zoom in on the image. As there is a 360° feature on the design your own ring section you have to wonder why there isn’t one on all the products. If they can employ this technology in this section it should be available across the board. I get the feeling that they have a website because they feel they have to. It is now clear why online sales account for so little of their revenue, and some investment is definitely needed if they want to make more of an impression in this very lucrative market. When you select a ring you can add it to your bag and buy it online or reserve it for collection from a nearby store. The check out process is smooth and uneventful, with Paypal being a useful and secure, payment option. Only when you get to inputting your delivery address do you find out they only deliver within the USA. You can have your item shipped to your US address or sent to a store and this should be made clearer from the outset. Despite the problems with the site, namely navigational and the challenge of finding the items I was looking for, the overall experience wasn’t too bad. The lack of overseas shipping wasn’t an issue to me personally and the checkout was very quick. I don’t like buying blind when you are spending so much money on something so special. This is always a risk as you only have their word for the quality of the stone you have chosen. If you aren’t a big risk taker then you may want to shop elsewhere. I have a feeling the site may be used more for reference purposes rather than actual sales and to appeal to search engines. There is a pretty good education section tucked away down at the bottom among all the other options but you have to search for it. There is the general info on how to select a diamond etc but like the rest of this site there is way too much in this section which just isn’t necessary. I appreciate that knowing quite a bit about diamonds does set me, and every other reviewer, a step above the majority of buyers but I simply don’t like the fact they appear to judge those less knowledgeable about diamonds as their dream customers. 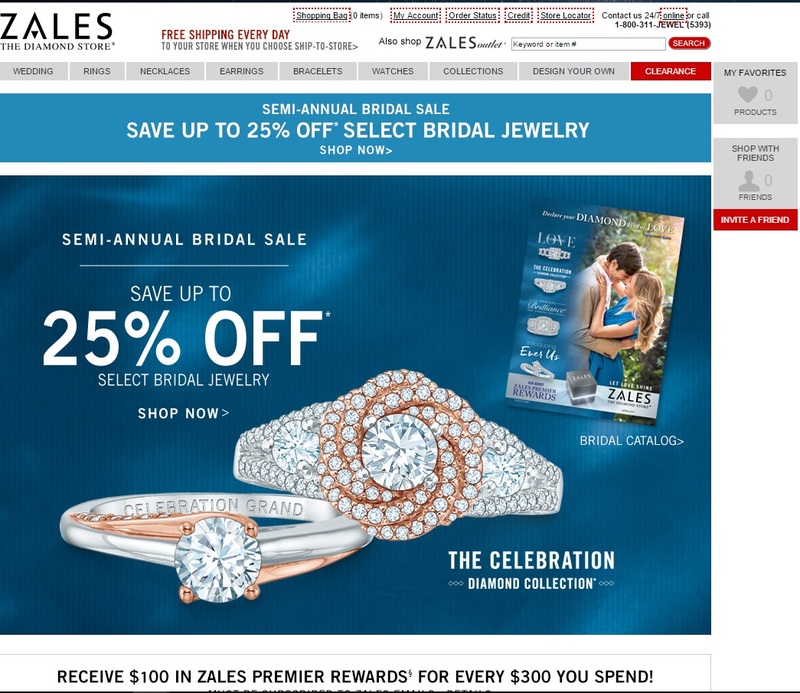 There is such a thing as having too much choice and the Zales website is a prime example. When we finally tracked down the engagement rings there seemed to be an endless choice of settings before you headed off to blind buy your stone. We have already proved that they can be beaten on price so you are probably best off heading to Whiteflash or James Allen to get the best quality at a better price, and actually see the stone in that engagement ring before you buy it. It’s hard to describe the packaging when you can find no reference to it except for a line which states “comes complete with free gift box”. I actually had to do an Internet search to find out what this box actually looked at and it was nothing special. I’m guessing that they think the name Zales emblazoned on the cardboard-looking box is good enough but the overall impression is the same as the website; cheap. One of the features mentioned in the first paragraph was their 60 day returns. This is a lot longer than many other companies and runs from the date of purchase. There are a few T’s and C’s attached to their returns and exchange policy. Rather than drone on about these you can find them all here. Sorry Zales but you have fallen well short of the mark as far as this reviewer is concerned. The lack of clarity concerning the quality of the products is a major concern and I am not a fan of blind buying and the risks involved. 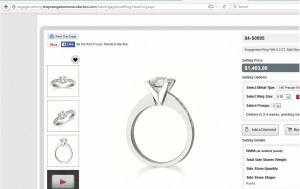 It is unforgivable that this is how you choose the stones when you design your own ring and this feature should really be renamed “pick your own setting and good luck with the stone” We have also proven they aren’t as cheap as they claim to be either so I have very little in the way of praise for Zales. There is no excuse in this day and age to have such a poor quality website. The fact it promotes their stores blatantly throughout this site makes it clear where their priorities lie. There is too much information and they have earned their 2 stars for having Vera Wang on board and for their 60 day refund policy. These days there is only one thing worse than having no website and that’s having a bad website. 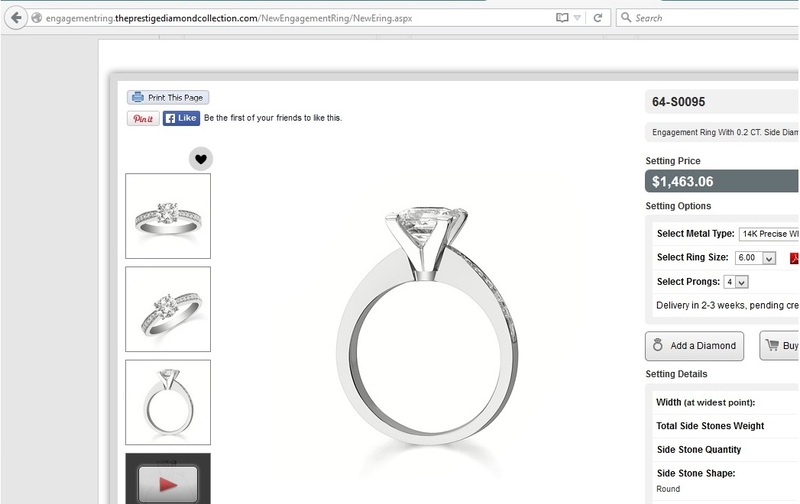 Take a trip to Whiteflash or Tiffany to give yourself an idea of what a diamond e-commerce site SHOULD look like.